Today is one of those cold and grey days, the sky is white, its not quite cold enough for snow, but its certainly is not warm. We did have snow at the beginning of the week, so it was fires on and wrap up nice and cosy, but it has gone on a few days now, the snow has melted, the sky is cloudy so it is holding in that cold air and there is a bit of a nip in the wind. So what does that mean, so for me that means there has to be some baking going on. I was working at my PC earlier and there was a few messages of sunshine cakes and those wonderful cakes that are ideal in the summer, but I decided I needed something that would be delicious with a cup of tea this afternoon. I had a look in the cupboard to see what ingredients I had readily to hand. Don’t really want to have to go off shopping, its too cold for that nonsense (ha ha), this is about having a good look in the cupboard for the basics and other ‘things’ that I can add to my cake. In the cupboard of course I always have the basics, eggs, flour, butter, sugar, milk, but what else could I use, banana’s so thats it, decision made. This is a delicious moist cake and it makes up quickly and bakes quickly, the only thing is you have to wait for is it to cool down before you eat it…. This cake is great as it has minimal ingredients and quantities and it produces a wonderful loaf cake. You can add banana chips to the top of the cake and a little icing, depending on who the cake is for and if you want to dress it up. I didn’t bother with the banana chips today, (didn’t have any in the cupboard) but a loaf cake can always get better with a little icing on the top. Icing sugar is another one of those ingredients I always have in the cupboard too. This cakes makes up so fast, it really does benefit from having very ripe banana’s but if yours like mine were still a little firm, then just chop them up, place into a bowl and place in the microwave for 20 second bursts, to warm them up and soften them, it does work a treat. Weight the butter into a bowl and soften it, again I chose to use the microwave as I didn’t want to wait. I placed the butter into the bowl and then popped it into the microwave for 20 seconds, I wanted the butter to be soft but not melted. Then I added the sugar to the softened butter, and using an electric whisk, I beat the mixture until it was light and fluffy. I added 1 egg and whisked the mixture then half of the flour/baking powder mixture, mixed again and then repeated with the remaining egg and then the flour mixture. 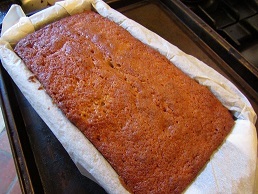 Once this was all combined, I added the softened banana mixture, this loosened up the mixture, I knew this was going to be a wonderful moist cake as the mixture was soft and fluffy as I poured it into the lined baking tin. I had the oven preheated and then popped the baking tin into the oven on a tray. Then settled down to write up my recipe and wait for the smells to fill the kitchen and the wonderful cake to come out of the oven. Once the cake was ready 1 hr, I tested with a skewer just to make sure. I let the cake cool for 15-20 minutes and then I mixed the icing and painted it over the top of the cake. Then it was time for the kettle and a cup of tea and a delicious slice of banana loaf cake, it was divine, so moist and bags of flavour. 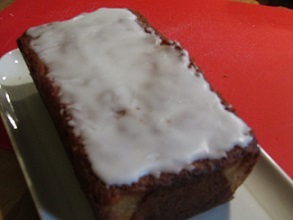 Delicious banana loaf, moist and tasty, ideal for that afternoon treat. Pre-heat the oven to 180c conventional/160c fan/4 Gas. Peal and mash the banana. (If the bananas are not very ripe, chop them and put in a bowl and place in the microwave for 40-60 seconds at 20 second bursts, until they are soft and easily mashed). Weight the butter into a bowl and place in the microwave at 20 second bursts until you have softened butter. 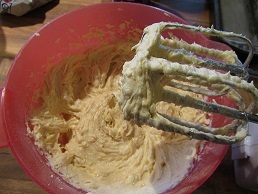 Add the sugar to the butter in the bowl and using an electric whisk, whisk until the mixture is light and fluffy. Weight out the flour and add the baking powder to the flour, mix together. 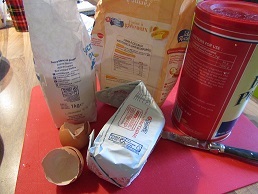 Add 1 egg and whisk again, then add half of the flour and whisk again, repeat with the other egg and remaining flour mixture. Add the mashed bananas to the mixture and whisk again until just combined. 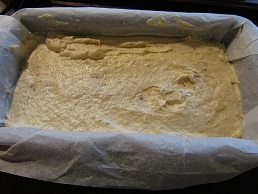 Line a 2lb/1kg loaf tin with grease proof paper, using a spatula, pour the mixture into the tin and place on a baking tray and place in the centre of the oven. Bake the cake in the oven for 50-55 minutes. Remove the cake at 50 minutes and check the centre with a skewer to see if it is done in the middle. If not, then place back in the oven for a further 5 minutes and check again. Once ready, remove from the oven and allow to cool in the tin for 5 minutes, before removing from the tin and leaving on a rack to cool for a further 15 minutes. Weight the icing sugar into a small bowl and add a little water, mix until you have the right consistency.... not too thick, not too thin a bit sticky, you want it to stick t the top of your cake and not just run down off the top. Add banana chips to the top for decoration if you want to dress this up.